Sometimes, stuff is just to cool not to share. Here are some interesting things currently going on in the comic book world. The Huffington Post has a 13-page preview of Joshua Dysart and Cliff Chiang's Greendale. Published by Vertigo, the story actually came from Neil Young. Yes, that Neil Young. It's been getting glowing reviews, like, everywhere. Based on the 2004 concept album of the same name, it's being called the first "rock novel." Comic Book Resources has a joint interview with Jim Lee and Dan Didio on where DC as a publisher stands today. Outstanding in it is an exclusive preview of J.H. 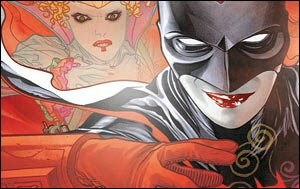 Williams III's new Batwoman series. CBR also has an interview with Adam Beechen on writing Batman Beyond. In it, he says that Terry may meet "his" Catwoman. I kind of thought that Ten was his Catwoman. Ty Templeton, famed artist of Batman Adventures and Spider-Man/Human Torch, has started a webcomic! Yay! Art Spiegelman teams up with the Pilobilus dance troupe to create a homage to early 20th century cartoons, including Happy Hooligan and Little Lulu. I wonder whatever happened to his planned "comic rock opera." If you have any other cool stuff regarding comics out there, paste 'em in the comments!